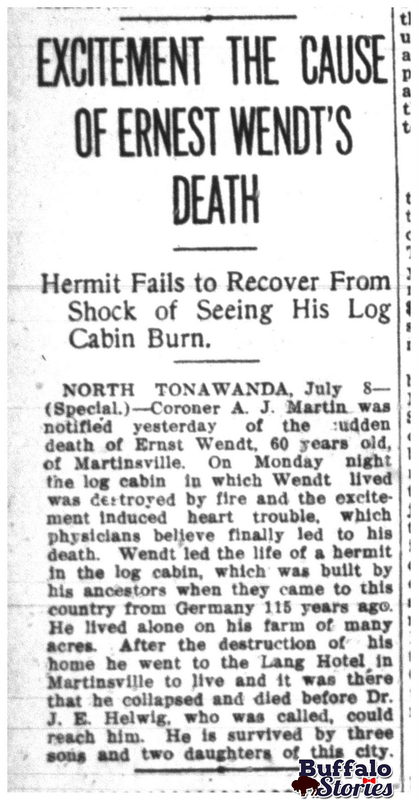 The log cabin was on the land farmed by his father, Christian Martin Wendt, who came to Niagara County from Prussia in 1843. Ernst Wendt was born five years later in 1848. The William Street landmark was destroyed after it was set ablaze by children playing with fireworks. The following night, The Tonawanda News spared few feelings in announcing Wendt’s funeral plans. The funeral of Ernst Wendt of Martinsville, who dropped dead at the Lang Hotel on William Street on Wednesday night, will be held from the Sahr home at No. 431 Robinson street tomorrow afternoon. Burial will be in Elmlawn. Schultz and Mrs. Frederick Sahr, all of North Tonawanda, survived him.